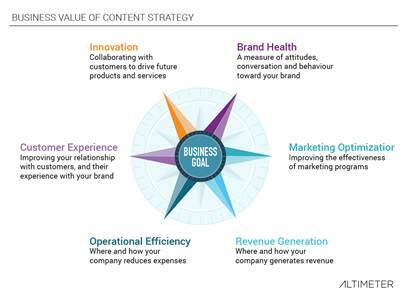 The foundation of content strategy is goals. Without knowing why content will be created and published — to what end, for whom, where, and how — content marketing is at best a spurious, ad hoc activity. Yet when my colleague and partner-in-research Susan Etlinger and I sat down around a year ago to discuss the state of content measurement, we quickly realized growth in that sector is nowhere near commensurate with the overall growth of content marketing. This lead to research into what KPIs marketers should be working toward and measuring for in content, the subject of our latest research report titled Content Marketing Performance: A Framework to Measure Real Business Impact (free PDF download). Content can indeed lift sales, but it can achieve so many more measurable, revenue-linked goals associated not only with marketing, but with other business areas, from product development to customer service. Our research outlines some of these KPIs, but goes further in that it helps marketers determine not just what to measure, but how to measure it. In fact, there is no content strategy without measurement strategy. Before embarking on a content initiative, irrespective of medium or platform, it’s important to know what you want to achieve. Is it to drive more awareness? Build an audience? Encourage people to convert? Reduce call center expense by deflecting appropriate queries to a digital channel? Each requires different metrics — for content, yes, but also to calculate whether you have achieved your goal. Set and prioritize goals and desired outcomes, develop KPIs to track these, and measure and iterate constantly. An increase in reach can show audience growth. An increase in shares (preferably combined with other measures of engagement) can show engagement. To understand whether a content strategy has affected brand reputation, you must have a benchmark, measure sentiment, and look at the before and after. It’s critical to have an analyst who can perform this correlation with an eye to other confounding factors. For example, a “viral” video may be immensely popular, but if there is a product recall, pricing change, or other factors, it may be difficult or even impossible to assess the impact on the business overall. Some signals, like click-through rate, are clear and relatively easy to assess. Measuring sharing behavior requires that an analyst assess multiple platforms — Facebook, Twitter, Pinterest, Instagram, etc. — to define what “sharing” actually means. Compounding this issue is the fact that some of the most valuable data — for example, private Facebook data, or Snapchat data — are not available for privacy reasons. So analysts must take that into account as they assess impact and create defensible benchmarks as part of their process. Because content performance data comes in a variety of shapes and sizes, from various platforms, it often requires a great deal of manual intervention to analyze properly. This is simply a reality of the market today; content vendors often supply their own analytics dashboards, while social media tools also serve to measure content reach, resonance, and other (content-specific) outcomes. It is not uncommon to require a mixture of web analytics, content measurement, marketing technology, and social media tools to assess the impact of content. As a result, content strategists should work with their analysts to develop a realistic (short-term) and aspirational (long-term) measurement strategy. Otherwise, content strategists and business leaders will inevitably become frustrated, while analysts will burn out from all the manual work needed to deliver reports.